Making sure your business stands out from the crowd is always important – but it’s especially important around Christmas. In a digital world, many companies are bucking the trend and turning to print to help them boost their festive campaigns. The following awesome Christmas print marketing examples are perfect for inspiring your own marketing strategy this year! At the end of 2017, Sir David Attenborough’s Blue Planet II let us see an underwater world we’d never seen before. As well as showing how truly breath-taking our planet is, it also raised the issue of plastic pollution. Thanks to this, 2018 has seen a huge rise in awareness of our environmental impact– with many cities and countries looking to ban plastic straws and drink stirrers for good. 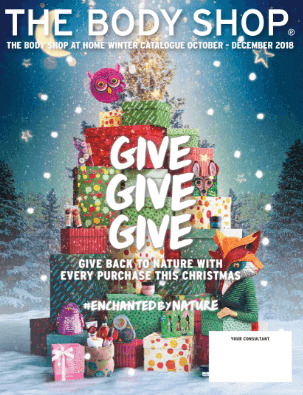 Reducing our environmental footprint is a key goal for cosmetics company The Body Shop, so it’s no surprise that their 2018 Christmas campaign, #EnchantedByNature, aims to give back. Their promise this year is to “help protect and re-wild over 10 million square meters of forest with every product purchased this Christmas”. This helps make their Christmas catalogue even more tempting! And, to judge a book by its cover, we love the Christmas night in the forest theme, featuring a selection of woodland creatures (how many can you spot?). ‘Give, give, give’ is a clever message with two meanings – giving gifts is a huge part of Christmas, but we’re also reminded of giving back to the environment. Inside their catalogue, The Body Shop have everything their customers expect from them at Christmas: seasonal bath & body, gifts and winter party makeup – and the fact that every purchase goes towards helping the environment resonates strongly with their target market. In the war of the Christmas TV ads, Debenhams are taking a step back this year to focus on another big 2018 marketing trend – experiences! It’s no coincidence that their choice to tone down their advertising this Christmas comes after a difficult year for high street retailers. 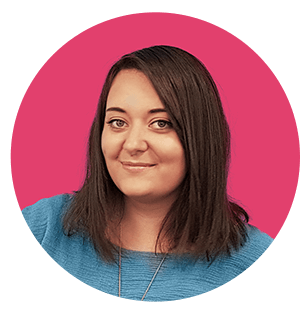 Cristofoli states that the key thing marketers will be doing this year is “thinking really carefully about how they spend and invest to maximise return on investment”. And how have Debenhams maximised their return on investment? With print! 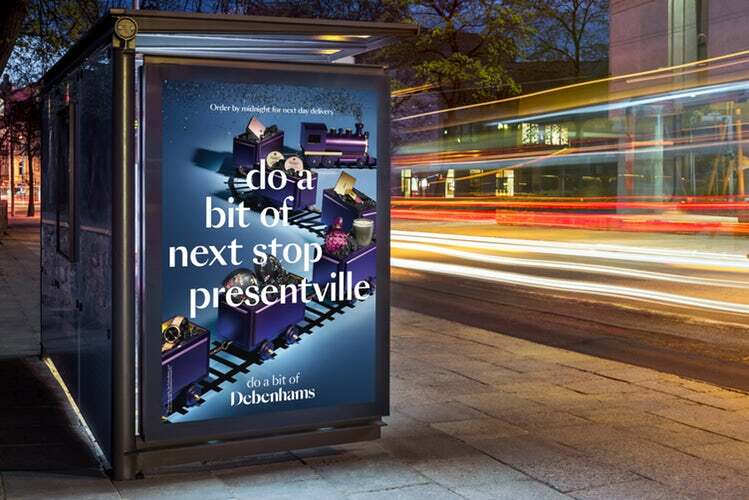 Affordable yet effective, Debenhams have used bus stop posters to remind commuters of the joy of gift-giving. We particularly like the link in with transport – next stop presentville! It’s extremely suitable for a bus stop poster, whilst the imagery reminds us of toy trains: the quintessential Christmas gift. Since 2011, burger restaurant, Byron, host ‘Cheesemas’ – something they call their ‘annual celebration of the great British tradition of overindulgence’. Having an annual campaign is great for awareness – each year more people get on board until there’s a growing list of loyalists waiting outside to grab the cheesiest burger in town. Cheesemas is incorporated into all of the restaurants’ branding – from menus to coasters. 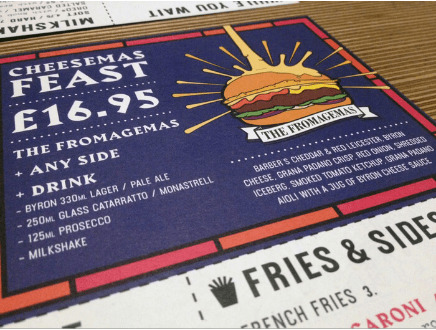 But our favourite Cheesemas print marketing tools have to be these placemat menus and A-frames! 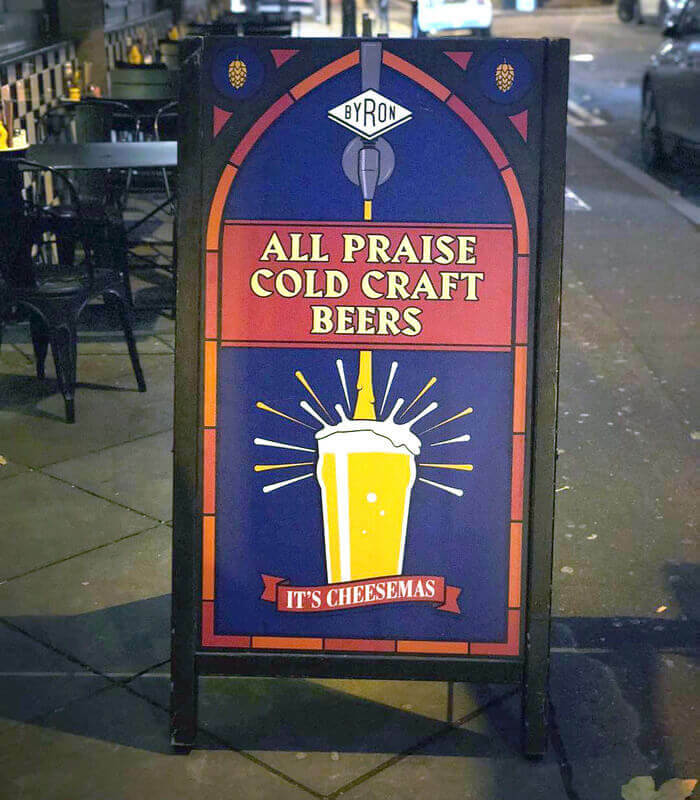 The ecclesial, stained glass effect created by these designs connotes the religious origins of Christmas – and is possibly a tongue-in-cheek statement about just how good these burgers are! The impossible task of finding the right gift is an age-old Christmas issue. So, why not be like Cineworld and provide the perfect solution? 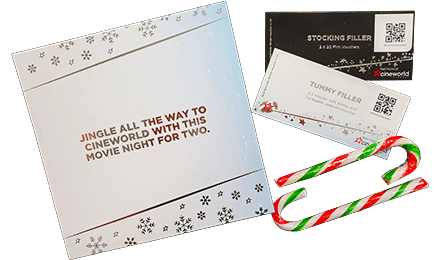 Their Christmas gift box is a gift voucher bundle that has everything you need for a night at the cinema for two. And all for £25! As part of the gift, you’ll also receive a movie-themed Christmas card to send to your nearest and dearest – which, to us, is just the icing on top of the Christmas fruitcake! If you do decide to follow suit, business cards double as great gift vouchers – and you can create your own right now using our free design online tool! 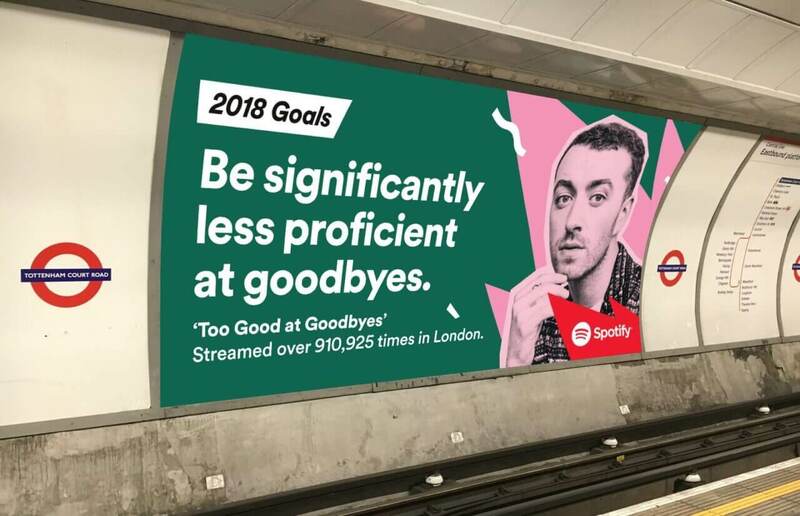 Using humour to grab attention, Spotify’s 2017 end of the year campaign, ‘2018 Goals’ featured over 70 artists! How did they make sure their print marketing would be seen? They went BIG. Just like New Year’s Resolutions, these goals took popular songs and twisted their lyrics into humorous semi-serious accomplishments to carry forward into 2018. It’s common knowledge that we buy from people we like – and research also shows that an emotional response to an advert influences consumers’ intention to buy more than the actual content. Trying to incorporate a positive emotion, like humour, into your Christmas marketing is a great way of boosting business. 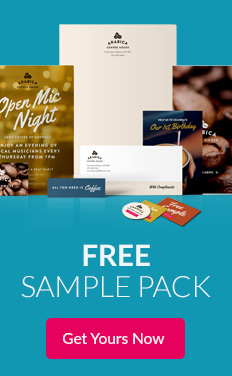 This campaign was also extremely well suited to Spotify as a business. As a music streaming service, the music theme and extensive use of popular artists really appealed to a large target audience! 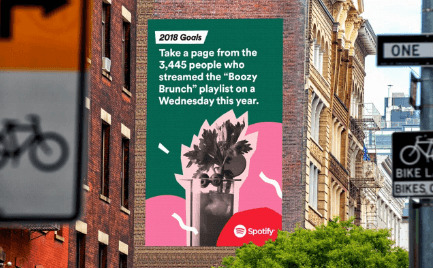 These huge posters got the songs in your head all over again – good job the Spotify app is just a download away, right? 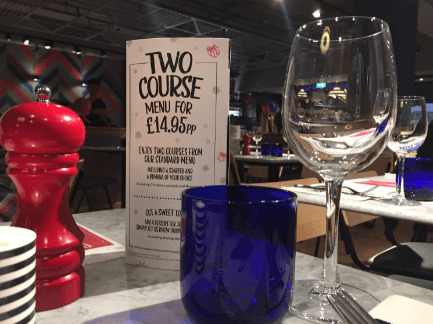 How do Pizza Express stand out from competitor restaurants at Christmas? By giving their iconic table talkers a festive twist! The perfect size for Xmas specials, table talkers stand up and stand out. If you want to show off any particular deals or dishes – either in a restaurant/bar or even on a desk or counter – a table talker tells customers ‘pick me – I’m limited edition’ to create the perfect sense of FOMO (fear of missing out). If you’re positively (red and) green with envy, don’t worry – you can create your own table talker easily using our free design templates. Our online design tool is super easy to use too, so you can create a Christmas specials menu to rival Pizza Express’ in no time at all! With all this festive inspiration, your mind must be brimming with ideas! 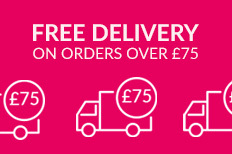 We’d love to see how you market your business with print this Christmas. Show us your print creations by tagging us on social media @instantprintuk or using #instantprintuk for a chance to be featured.